“Perfume as shadow” is a beautiful way to describe the feel of a dark, cool, sheer fragrance. To me, Hermann fills the bill. It also leans masculine and is almost infuriatingly persistent. Perfumer Quentin Bisch developed Hermann. Its notes include blackcurrant buds, black pepper, galbanum, calypsone, geosmin, frankincense, pepperwood, petalia, rose, patchouli and ambroxan. Hermann kicks off as tart and green and piney as I imagine the forest to be through which Victor Hugo’s protagonist rode. Imagine the new, pale green tips of a fir’s branches, almost citrusy, and you get the idea. This green veil loosens to reveal rose sweetened by amber. Most people won’t think of Hermann a rose perfume, though. The rose is more like the peg that anchors the rest of the fragrance. Underlying this is a large helping of sheer incense. Hermann isn’t as viscous as my description makes it sound. Lots of incense-inflected fragrances have a textural depth that is almost three-dimensional. You feel like you can touch them. Think of Tauer Perfumes L’Air du désert marocain, for example. You can almost take a bite out of that one and chew. By contrast, Hermann is cold and sheer, like an Eau de Cologne. Its forest-like feel hints at the freshness of lavender, and — at least in its opening hour — its tartness makes it bracing. The rose and amber at its center soften its edges a bit, but this is no cream puff of a perfume. 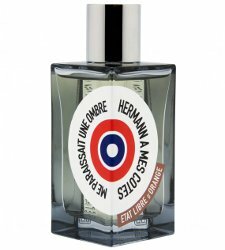 Where Hermann is not like Eau de Cologne is in its skin-stickiness. I put a dab of Hermann — seriously, at most a milliliter — on both wrists yesterday before breakfast. I wore it to work, where I washed a week’s worth of coffee cups; put on land lotion; walked home in the pouring rain, no gloves; and took a bath. When I went to bed, I still smelled tangy incense on my wrists. 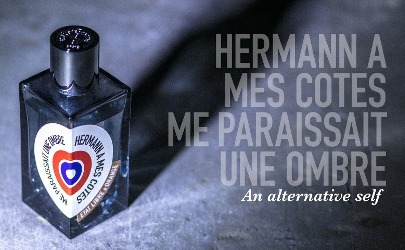 Although Hermann has a lot of presence, I can imagine men who don’t generally go in for fragrance liking it. They might see it as “clean” and “not perfumey,” although I think it has more interest than that. Besides being a gateway scent, it would also make a good everyday, put-it-on-and-forget-it scent for someone who likes green, traditionally masculine fragrances. Etat Libre d’Orange Hermann à mes côtés me paraissait une ombre Eau de Parfum is $85 for 50 ml and $149 for 100 ml. For information on where to buy it, see Etat Libre d’Orange under perfume houses. 1. Which would be a really cute name for a dachshund. Someday we should do a post on pets named after perfume. I’d like to sniff it, if I ever find myself near a shop that sells ELO. On your other topic, I’ve known more than one dachshund named Hermann, or at any rate Herman. They were the independent sort, however, rather than the stick-to-your-heels shadow type of dog. But they’re happy to get under your feet…. And yet so low to the ground! But they can be so goofy! Mine had a great sense of humour, plus running with that long body and those floppy ears is hilarious in itself. It’s almost like living with your favourite cartoon character. I always have to have animals in my life. I don’t know what I’d do without them. I so agree, but I’m unfortunately too busy to raise another dog at the moment. Hopefully next spring it will be feasible to have another dachshund. Life without a dog is rather empty. Yes, Oscar. My own extended family has also had dachshunds named Gussie, Blitzen, Augie (Augie Doggie) and Jenny Lind. Great review, and as the former owner of a dachshund, I love your reference to my favourite breed. Not many are called Hermann in the Netherlands, although people do tend to give them quite pompous names. And for once, I just love the name of the fragrance. A dachshund named Schatzi (I’m probably spelling this wrong) lives in the neighborhood, and a good friend has a dachshund named, hilariously, Zucchini. Mine was called Joséphine, named after Joséphine de Beauharnais. Spot the link to Napoléon! Delurking to get in on the dachshund talk! Our red mini is named Agnes, and she is exactly what the name suggests. She’s named after Principal Seymour Skinner’s mother on the Simpsons; at first we thought we were getting a male, who would be named Seymour (why we decided on this, I do not know!). But with the sudden gender switch, we made the leap to Agnes and it suits our sanctimonious little old lady perfectly. If a dog could put her hands on her hips and talk down to you, it’s Agnes. Agnes is a great name for a dachshund, as is Seymour. Agnes. That’s so funny! I can just imagine her, ears flapping, telling you to get off your hind end and feed her, if you please. … now imagine it being requested in a high-pitched British accent (despite us living in Canada) and you can imagine what my day is like! She should have her own comic strip! I really disliked this when I got a small sample, but your review is making me think I should revisit it. First to find it! I sniffed and passed the first time around, too, then decided to give it some skin space. I probably wouldn’t buy a bottle, but it was fun to sample. I wanted this to be WONDERFUL because of the mysterious name. I’d also like Jasmin et Cigarette a bit less harsh. I feel like Jasmin et Cigarette has changed a bit over the years and become less ashy. Or is that my imagination? It doesn’t sound like the geosmin is very prominent. Pity, because it smells just like freshly turned earth. Thank you for mentioning the geosmin! I’ve never smelled it on its own, and freshly turned earth sounds great.